We've just returned from a short break in the Hunter Valley which was very relaxing. Now our thoughts are turning to back to school and work over the next couple of weeks... where have the holidays have gone? This afternoon I've raised the hems on a couple of new school uniform dresses and ironed on name labels onto several new uniform pieces. We have one excited 12 year heading off to high school very soon. Covering the text books is one of the next jobs on our list. I have some exciting Ribbons Galore news which I really should have shared at the end of 2010 (but due to circumstances beyond my control, last year didn't end as I planned). Earlier last year I was contacted by the lovely Toni Coward of Make It Perfect. She was interested in using some ribbons for her new project, a new book called "Make it Perfect". A couple of weeks ago I finally bought the book while I was in th city at Kinokuniya (I also bought the latest Cotton Time, I just couldn't resist!). Toni's book is gorgeous. The projects are fun, bright and happy with a mixture of projects/clothes for kids and adults. The patterns are full sized (no need to enlarge) and multi sized. My first project will be an apron from the book. Just trying to pick the right fabric. Ribbons Galore was also featured in Donna Hay magazine (Dec 2010/Jan 2011 edition). This time of year is normally a time for relaxation, with many families enjoying the school holidays. Unfortunately this is not the case for many, many people across Australia at the moment, not such a happy new year for everyone. 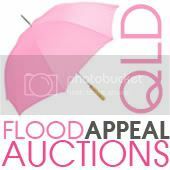 Toni Coward and her sister Carli are co-ordinating fund raising auctions/raffles for those affected by the Queensland floods. I'll be joining in the fund raising effort with a raffle for some Ribbons Galore ribbons. I'll be posting more details in the next couple of days. In the meantime, please visit Toni's blog to read more about this fund raising effort and current auctions.